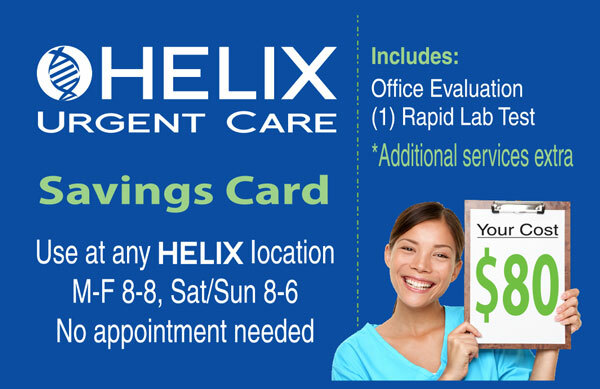 Save with Discount and Pre-Paid Urgent Care Cards! Sold in packs of 10 for $50, each card saves your employee between $19 and $44 on a self-pay visit. 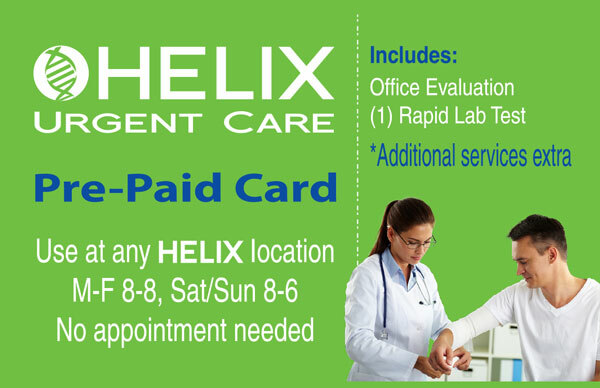 Card is valid at any Helix location. Bearer is required to present card in order to receive discount. Additional services (if required) billed at regular self-pay prices. This card is for self-patients only. It is not insurance and is not valid for the payment of insurance co-pays. Sold in packs of 5, each card covers the cost of evaluation by our medical provider, plus a (select) rapid lab if necessary. Card is valid at any Helix location. Bearer is required to present card in order to utilize pre-paid services. Additional services (if required) billed at regular self-pay prices. This card is for self-pay patients only. It is not insurance and is not valid for the payment of insurance co-pays. Office evaluation by medical provider.